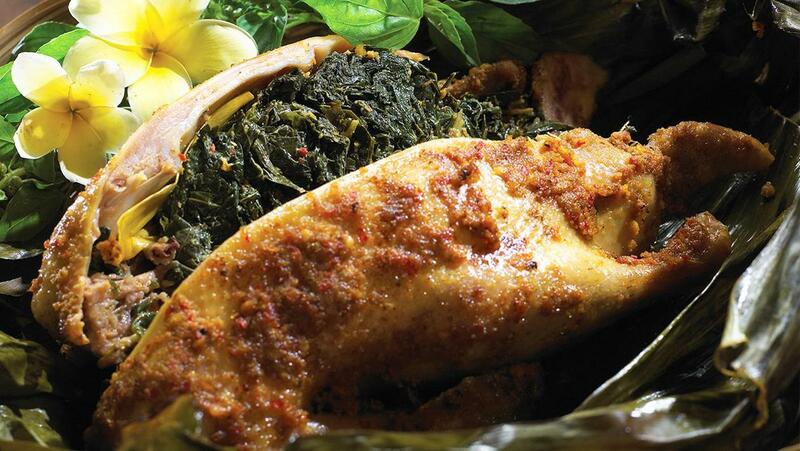 This authentic Balinese cuisine is very famous. The combination of Balinese spices and Knorr Bumbu Dasar Merah dan Kuning Base make the dish unique in its flavor and definitely will always favourable. Mix Knorr Red and Yellow Bumbu Bases with other pre-mixed ingredients, set them aside. Take half portion of mixed ingredients to rub the duck and leave for about 30 minutes. Saute another half portion of mixed ingredients, add in cassava leaf and bit water. Cook on low heat until the leaf soft. Stuffed cassava leaf into the body of the duck and then tight together with toothpicks. Rub the remaining sauce onto the surface of the duck and underneath skin. Wrap it up with banana leaves and steam for about 1.5 to 2 hours. Then roast in the oven for about 2 hours at 180°C. Take out, open the banana leaf and serve.